Umiya Publishing creates a wide range of books that touch upon spirituality, Zen, and positive messages. 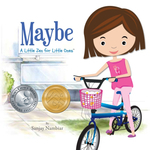 Our featured series, A Little Zen for Little Ones, puts classic and new Zen stories in an accessible context for today’s kids (and adults!). These revered tales provide a little perspective on what’s truly important, on how personal balance and peace can manifest in everyday life. With children as central characters and narratives that reflect modern culture, A Little Zen for Little Ones helps us examine our values as our world becomes more complex and confusing. After all, if our children can get a little bit of Zen in their lives, perhaps they’ll grow up to be adults with a little bit of Zen as well. Wouldn’t that be great for all of us?